Magic hour, originally uploaded by Goggla. 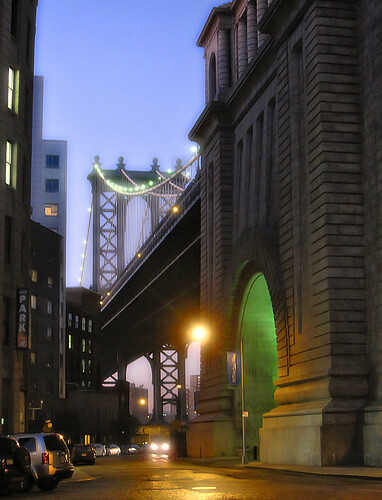 There's something magical and mysterious about the Manhattan Bridge that attracts me to it, no matter the time of day or year. Celebrating its 100th birthday this month, it's looking lovelier than ever. When ever I'm feeling stressed or down, I head down Henry St in Manhattan to the underbelly of the Bridge and Mechanics Alley. The shadowy arches at that end rise up majestically as you head east towards the river, creating a cavernous cathedral beneath. I feel the bridge's size down here. This view is looking west from the Brooklyn end. Here, the arches glow green and the necklace lights seem to dangle like jewels. This is the bridge's best face, I think...tall, elegant, noble, but full of secrets. These shots are stunning. Is that green light in the archway natural or did you enhance it? Great shot. I'm glad someone else loves the Manhattan Bridge. Not as lovely as the Brooklyn or quite as scenic as the Williamsburg, but I've always loved it's very long arch over the river, those great arches in both Manhattan and Brooklyn.